Osteoporosis is a condition in which the bones become brittle and can often lead to painful spinal conditions. Let’s take a look at how osteoporosis and the spine are related. 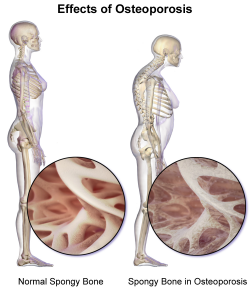 Osteoporosis is a condition in which the individual has weak and or brittle bones. This makes them more prone to bone fractures. Bones are made up of a protein called collagen and a mineral called calcium phosphate. The collagen in the bone creates a flexible matrix while the calcium phosphate gives the bone strength. Bones are living tissue. Throughout our lives old bone material is removed by our body and and new bone material is being formed to replace it. In children and adolescents the production of new bone is faster than the removal of old bone, thereby making it possible for children’s bones to grow larger and stronger. As we age and become full-grown, the rate of new bone production slows down. Somewhere around age 30-40 the amount of bone that is lost becomes greater than the amount of bone that is formed. As a result, bone mass is lost. As bone mass is lost and not replaced, bones become weaker and more brittle. Unfortunately, this disease can go unnoticed until a person breaks a bone. Individuals are diagnosed with osteoporosis based on their bone mass density (BMD), history of bone fractures, and rate of bone loss. As the bones become brittle with osteoporosis they are more susceptible to fracture. Oftentimes these fractures occur in the vertebrae of the spine. Vertebral fractures can be the result of a fall or something as simple as sneezing, coughing or twisting. Individuals with osteoporosis are more susceptible to the following conditions. Back and/or Neck Pain – A fractured vertebrae can lead to chronic back pain or neck pain. Depending on where the fracture occurs, the pain can be in the back, neck or radiate down one of the extremities (i.e. arms or legs). Height Loss – As the vertebrae lose bone mass they become thinner and more brittle. This can result in what is called a vertebral compression fracture. When one or more compression fractures occur, the height of the affected vertebrae are reduced and, as a result, the entire spinal column is compressed. This compression can lead to height loss. Hunchback (Kyphosis) – Thinner vertebrae also affect the curvature of the spine. As the front of the vertebrae become thinner, the spine is more prone to curving toward the back. This curvature results in hunchback (also known as kyphosis). As this condition worsens, people can develop what is called a Dowager’s hump. The condition can be painful due to the extra strain and tension on the ligaments of the spine. In addition, as the condition worsens, it can reduce the amount of space in the central body cavity for the body’s organs making it more difficult to individuals to eat and breathe effectively. As you can see, osteoporosis can have significant and painful effects on the spine. If you believe you have osteoporosis, or already have been diagnosed with it, talk to your primary care doctor and/or your spine doctor about ways to slow down the effects of the condition.